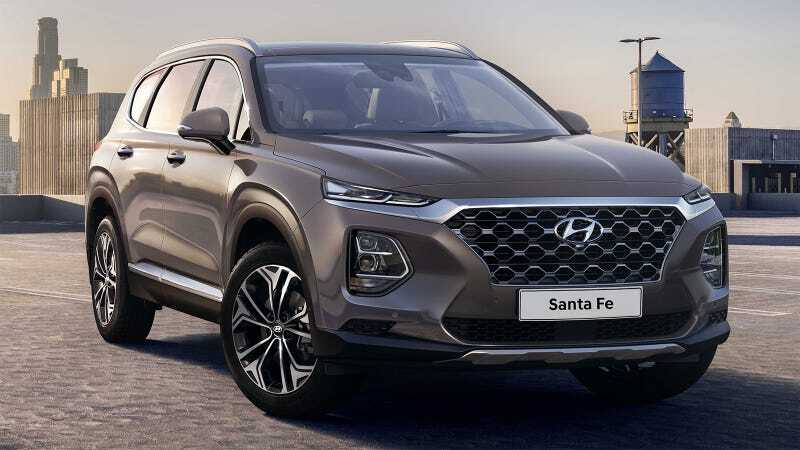 The 2019 Hyundai Santa Fe will be the first of the crossover SUV’s fourth generation, making its official premier later this month. But as you can already see, it’s adopted the serpentine squinty-eyes of the rest of the company’s lineup. So far all Hyundai’s disclosing about the Santa Fe’s specs are its length (187.8 inches) and width (74 inches). That’s actually a little more compact than the current Santa Fe, which stretches 193 inches tip to tail. But the new vehicle will apparently have a longer wheelbase than its predecessor, meaning its wheels will be further apart, which should theoretically make for better stability and interior room. Hyundai brags about driver aid tech, but the only thing it mentions that I’d never heard of is something being called “Safety Exit Assist.” The idea here is that the vehicle will lock itself if it sees you’re about to door a bicyclist or something. And while the exterior of the Santa Fe looks more aggressive than ever, the interior actually seems pretty cozy. We’ll find out more about the new Santa Fe soon, presumably at the 2018 Chicago Auto Show.